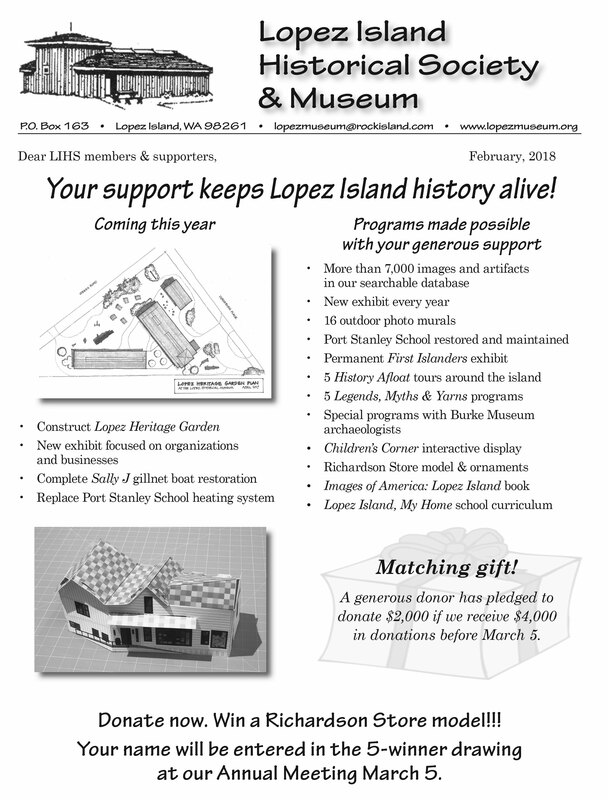 In January of this year, the Lopez Island Historical Society bade Mark Thompson-Klein a happy retirement with deep gratitude for his years of service. We also welcomed Amy Hildebrand as our new Executive Director. Our thanks to the Islands’ Weekly and Gretchen Wing for the great article announcing this change and introducing Amy to the community. Lopez History Afloat 6 will be Saturday, June 30 this year. This year’s theme is Living Legends, featuring settler-family descendants (and some later arrivals) talking about life on Lopez in the “early” days. We’ll announce the speakers early-June. Our 2018 season is about to begin! The museum is open for the season Wednesdays through Sundays, from Noon to 4 PM. The following exhibits will be on display—come visit and check them out! Lopezians have always been a diverse and resourceful lot. Some captained steamboats or ferries. Others delivered mail, ran a blacksmith shop, logged, split wood for steamers, or manufactured potash in the kelp plant. Lopezians operated switchboards from their homes for the Farmers Cooperative Telephone Company. Playing music, dancing, and “visiting” were essential components of entertainment and socializing in the small, isolated Lopez community during settler times. People sang or played in formal or informal groups, from a neighborhood “sing” to a stirring performance of the Lopez Cornet Band, resplendent in gold-braided uniforms. The first non-Native Lopez Islanders had to carve a new life out of a challenging and unforgiving landscape. An incomparable collection of more than 200 stone, bone and antler Native artifacts that represent virtually every aspect of First Islander life. A look at some of the notable and accomplished women in Lopez Island’s past. Explore the natural history of Lopez, including evidence of wolves on the island! An opportunity for parents and kids to create their own Lopez story.